The response to the devastating fire at London’s Grenfell Tower demonstrated the very best of public service. But as Matt Foster reports, the blaze raises major questions about the resources and respect given to those who work every day to keep people safe. "They got the call at 00:54. They were there within six minutes. It was like nothing they’d ever seen before,” says Dave Green, national officer for the Fire Brigade’s Union (FBU). In the early hours of 14 June, 250 firefighters using 70 pumps were locked in a desperate battle to control the blaze at Grenfell Tower, which had turned the skies around the Lancaster West Estate in North Kensington a fierce orange. Exactly how the tragedy at Grenfell – in which at least 80 people died – unfolded is now the subject of both a criminal investigation and a public inquiry, chaired by retired appeal court judge Sir Martin Moore-Bick. Meanwhile, central and local government staff have been working flat out to respond to the tragedy, with officials at the Department for Communities and Local Government (DCLG) working seven-day shift patterns to support councils and housing associations with the painstaking job of testing the cladding fitted to tower blocks. “Day after day I’ve seen dedication and commitment that goes above and beyond the call of duty,” the department’s Permanent Secretary, Melanie Dawes, told her staff in a message seen by PSM. 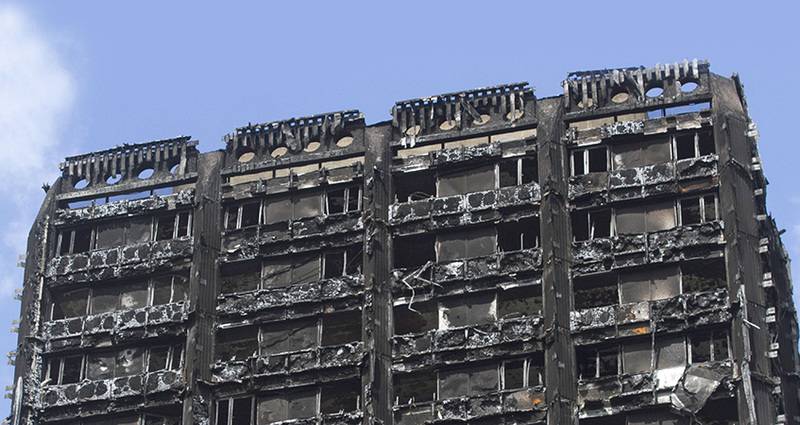 In 2005, however, the Labour government shifted responsibility for fire safety to employers and landlords, who were required only to appoint a “responsible person” to carry out in-house assessments. Green says this led to confusion over accountability and, ultimately, a relaxation of standards. Buildings can now be inspected by an unqualified fire risk assessor, with the fire service reduced to an overseeing role. 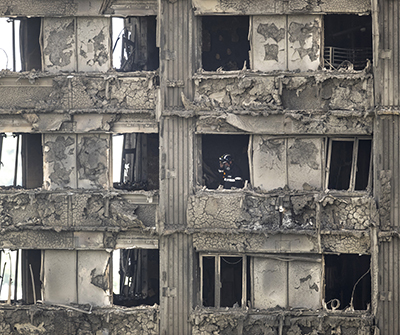 Crucially, Green adds, the fire service no longer has “any say in what cladding is put onto a building, or what holes are knocked through walls” – exactly the kind of alterations that can turn a previously safe building into a death trap like Grenfell. Behind the frontline, others are asking serious questions about the capability of UK public services to protect residents of blocks like Grenfell. Dr Richard Simmons is the former chief executive of the Commission for Architecture and the Built Environment (CABE), an advisory body abolished in 2011. He tells PSM that the “utterly shocking” events of 14 June should prompt us to question how ministers have come to value private sector advice more than the expertise in their own departments. “What’s happened is the government has increasingly come to depend on external advisers on building regulations,” he says. He explains how the Building Regulations Advisory Committee (BRAC), the industry-led voluntary body advising the government on building regulations, is chaired by the chief executive of a building consultancy, while the committee’s members include the technical director of a firm which produced the insulation fitted to Grenfell Tower – which many observers believe may have contributed to the spread of the fire. Although Simmons stresses that neither appointment implies any wrongdoing, he questions whether the “thinning out of the public service for reasons both technological and ideological” has undermined government’s ability to properly regulate industry. “You need expertise in-house,” he says. “You need people who can go and talk to ministers directly, and who can draw attention to issues which might not be highlighted by people in the private sector. Simmons agrees that central government needs to strengthen its oversight of key safety regimes. He believes that bodies such as the Building Research Establishment – privatised in 1997 – may have to be brought back in-house to ensure that experts’ concerns are properly heard in the corridors of power. “Ministers deserve the best advice they can get – and unless there’s a strong core of professional advice within the civil service itself, I don’t know how they’re going to get it,” he warns. Three months on from the fire, the blackened shell of the Grenfell Tower still looms over Latimer Road station. As the public inquiry begins to gather evidence and government officials work to ensure that such a tragedy will never be repeated, the FBU is calling for a permanent shift in the way Britain views its public servants.